3D printing taking steps to make impact in the marketplace. 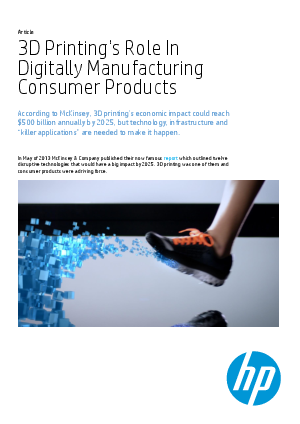 McKinsey & Company predicted the impact of 3D printing and direct product manufacturing could hit $500 billion annually 2025. But first, as John Hauer writes, the infrastructure for 3D printing – such as software, color capabilities, and affordable printing materials – needs to keep advancing.